This comment refers to the article available online at https://doi.org/10.1007/s00540-018-2597-2. The indwelling urinary catheter after transurethral prostate surgery (TUPS), frequently leads to catheter-related bladder discomfort (CRBD) in the postoperative period. Recently, agents with antimuscarinics, several opioids, anticonvulsant such as gabapentin, and anesthetics including ketamine and dexmedetomidine have been studied for the prevention and treatment of CRBD . Nevertheless, the optimal preventive or treatment modality has not been established yet. 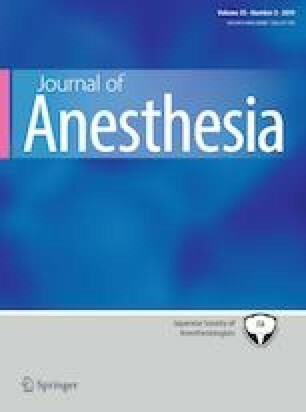 I have carefully read the article published in Journal of Anesthesia by Kim et al., and his findings are indeed interesting . This article is meta-analysis including 29 trials with 2841 patients, which addresses the issue of CRBD. Most of the drugs which have been evaluated in the study significantly reduced the incidence of CRBD. Especially, gabapentin appeared to be the best effective drug. Likewise, we have encountered a few papers regarding this medical condition, only which address CRBD using such drugs. Similar to the authors above, we are working on ways to reduce CRBD after TUPS. We conceived that spinal anesthesia has a CRBD-reductive effect during the early postoperative hours and improve postoperative outcome compared to general anesthesia, because spinal anesthesia has longer duration of analgesic effect than general anesthesia. As one of the key topics of the future medical practice is a patient-centered quality of medical care, safe and structured, multidisciplinary, and collaborative team approach will be a crucial part of postoperative care to improve patient outcome.